Estampe offers genuine online savings for a a large selection of automotive key tags specially designed for auto body shops and auto repair shops - from laminated key tags to plastic key tags, paper key tags and econo arrow key id tags. Estampe carries the popular plastic key tags called econo arrow key id tags. These econo arrow key id plastic key tags are very strong, self-locking and shaped like an arrow. Plus they can be written on and come in 6 different colors so you can set-up your own color-coded key management systems. Please browse Estampe's website to discover the many different automotive key tags you can choose from for your auto body shop or auto repair shop. 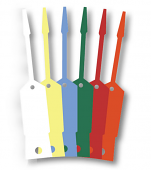 Use these five different colored Auto Dealer Multi Purpose Key Tags to organize your inventory by Model Year, Insurance Company, Franchise, Service Writer or whatever organizational system your repair shop or dealership needs. Perfect for anyone looking for automotive key tags. This Jumbo Self-Locking Vinyl Key Tags are easy way to keep customer keys organized. The larger size makes them easier to use by giving you more room to write. Made of vinyl, they are waterproof and will not tear or smear. The arrow shape tip allows them to self-lock insuring your customer's keys stay securely attached. Available in White or Yellow, you can mix colors for quantity price discounts. We sale these heavy duty Manila Tags with the wire pre-inserted for quick and easy usage. Available in both generic blank stock or custom printed with your own design. They come in six (6) different sizes, so choose the size that best fits your needs. Insure that your dealership's warranty claim process is always fast, efficient and organized by using these Warranty Parts Tags. They are heavy duty 10-pt. manila tags. 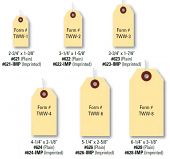 These tags are printed in black ink and have a strong reinforced hole with pre-inserted wire. A very high quality Automotive Paper Key Tag available in four colors to identify new and used cars, trucks, motorcycles and more. Rounded corners provide a great look and feel. Every department in your dealership - sales, parts and service - can use these blank generic Blank Manila Key Tags. These Plastic Key Snaps are strong, will attach in a jiffy and are rust-proof. Quick and easy to use, these tough 5" long attachments work with key tags or key rings and are made of clear nylon with a snap-system designed to be self-locking. We sell the original self-protecting laminated car key tags from Versa Key Tags. Look closely!! - many companies sell imitation Versa Key Tags which don't work as well. In fact, many companies sell imitation Versa Tags at a higher price then what we charge for the genuine Versa Tags. 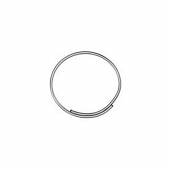 Buy key rings in bulk: These economical Split Key Rings are made of zinc plated steel. They're designed as single-wrap split keyrings and can be used with combo I.D. stickers and key tags, paper-plastic stock tags or any other key tag system used in your dealership's service or sales department. Arrow ID Tags-Econo Vinyl Arrow Key ID Tags: This automotive key tag is one of the most popular - sometimes referred to as self-locking key tags, arrow I.D. key tags and vinyl arrow shaped key tags. Write on these using any pen, pencil or marker. Simply attach key – no key rings needed! Top Stripe Automotive Key Tags: These plastic auto dealer key tags have a smooth finish and rounded corners. Plus, they look great. Made of rigid vinyl, these plastic key tags are easy to write on. We carry them in 6 brilliant colors.